Spruce Creek Country Club comes with many of the same amenities and activities as The Villages, at a fraction of the overwhelming size. The Villages is a sprawling active adult community in Central Florida, comprised of 56,258 homes. It’s big. It’s populated. It even spans multiple counties and has three zip codes. Living in a place the size of a city has its benefits, but if you’re looking for something smaller, where you can really get to know your neighbors. We have some interesting options, all with the same desirable location and a healthy list of amenities and attractions The Villages provides. Spruce Creek is a 55+ community built by Del Webb, with 3,250 single-family homes. Located in Summerfield, just outside of Ocala, it's near a national forest and idyllic horse farms. There are eight different home models for buyers to choose from, ranging in sizes that start at an 820 square-foot, two-bedroom home to three- and four-bedroom homes with over 2,000 square feet. It’s where you’ll find the Eagle Ridge Golf Club, which has four nine-hole golf courses. There’s also a pro shop, driving range, and a putting green. Other amenities at Spruce Creek include shuffleboard courts, a resort-style pool, and a 32,000 square-foot clubhouse called The Horizon Center. There’s a fitness center with a lap pool, an aerobics studio, and a massage room. 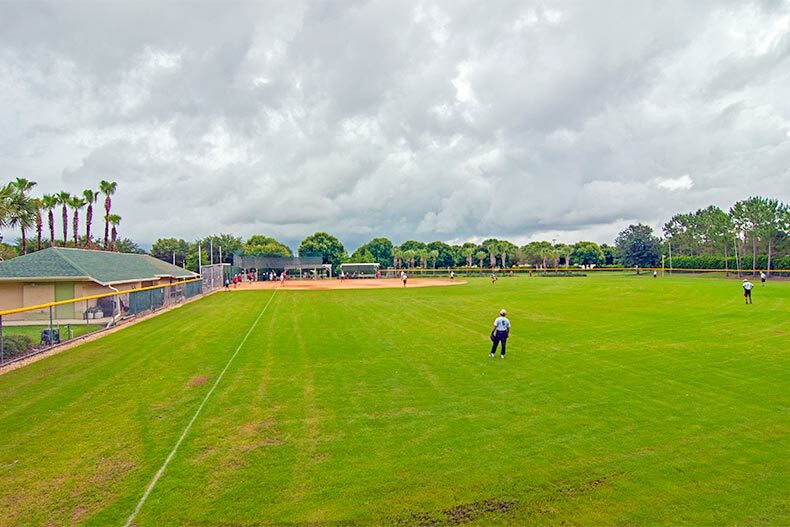 Residents can enjoy softball, horseshoes, volleyball, fitness classes, and exploring the nature preserve. You’ll stay as busy as you want with all the clubs and activities that are available. Also in Summerfield is Stonecrest, a gated 55+ community for active adults who appreciate the feeling of community. There are 2,200 single-family homes with a variety of floor plans for buyers to choose from while they are house-hunting. Recreational and community activities are very popular at Stonecrest. There’s a clubhouse called The Crest Club as well as the Somerset Community Center where groups hold meetings and performances. Clubs, activities, and classes at Stonecrest include everything from canasta to photography to softball. There’s a club for singles, golf enthusiasts, and even regional clubs for people who come from the East Coast and the Midwest. At the Stonecrest Country Club, there’s an executive Par-3 golf course and an 18-hole championship golf course. Leesburg is one of the few areas in the otherwise flat state of Florida that features rolling hillsides and green mountains. It’s also home to Pennbrooke Fairways, a community of 1,200 single-family homes for residents 55+. The property includes lakes, nature trails, and three golf courses. The first homes built in this community were mobile and manufactured homes. Cottages, villas, and duplex models soon followed and are also available to buyers. They are sized from between 500 square feet and 2,000 square feet with one or two bedrooms. Two recreational centers host a series of indoor and outdoor activities and amenities. There’s a welcome center that includes a beauty salon, a library, and a business center. Residents enjoy activities such as softball, bowling, book club, line dancing, and trivia. There are pools, shuffleboard courts, a fitness center, and a heated water volleyball court. Just a short drive from the community are several parks and a scenic road that winds along the Green Mountain Parkway.